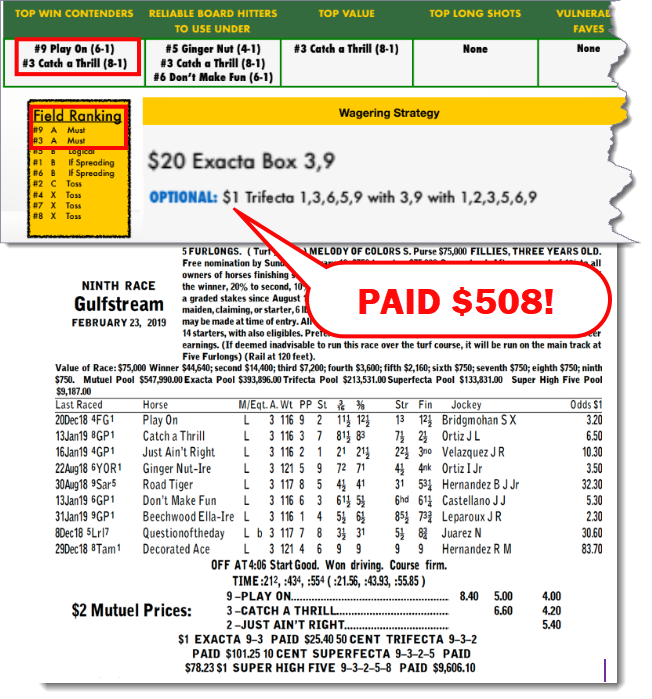 Home / Super Screener Results / Super Screener Tickets Cash Big at Santa Anita, Gulfstream! Super Screener Tickets Cash Big at Santa Anita, Gulfstream! 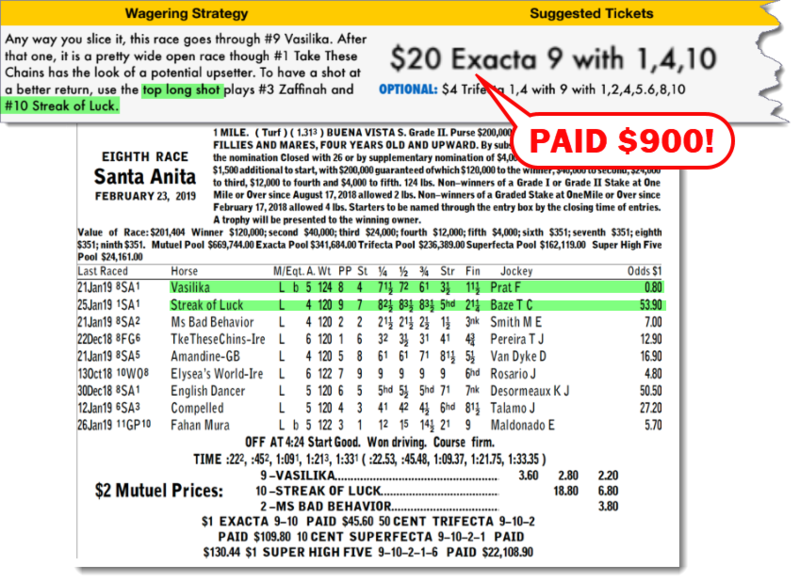 The Super Screener’s top 2 ranked horses completed the cold Exacta in this race and kicked off a $508 payoff on the suggested Exacta wager. 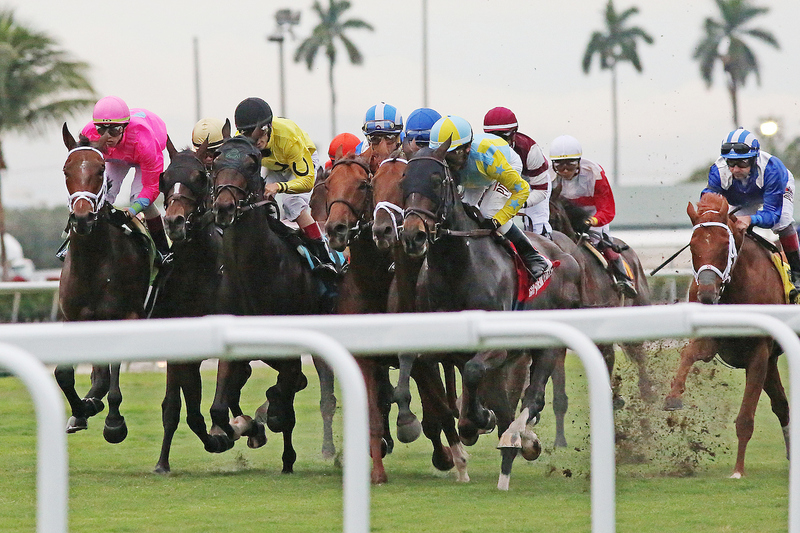 As is often the case in these 5-furlong turf sprints at Gulfstream Park, #9 Play On jumped to a clear lead and then ran them off their feet to a dominant victory. Our second choice, #3 Catch a Thrill, did just the opposite closing from near the back of the pack to pass 6 horses in the final yards to snare 2nd place at decent odds of 6-1. While the Pletcher barn may be struggling with their 3-year-olds, the winning ways with older horses continued in this race as stablemates, #9 Prince Lucky and #7 Copper Town, easily dominated here completing the Exacta. Quip ran a decent 3rd but clearly needed the race as a vulnerable favorite type. Tale of Silence hit the Superfecta again as the Top Board Hitter in the race. The Super Sceener Top Long Shot pick, Sir Anthony, just missed finishing in the Superfecta and is another that clearly needed the race as he runs better with a bit of foundation under him. There was little question that the Super Screener Top Win and Top Board Hitter pick, #9 Vasilika would dominate this field. She sat comfortably off the hot pace and when it was time to go, Flavien Prat just hit the “go” button and off she scooted to the easy win. However, even more impressive was the performance of the Super Screener Top Long Shot pick, #10 Streak of Luck. This Tyler Baze-piloted mare followed the winner around the track and closed just as willingly to complete the Exacta as the longest shot on the board going off at gargantuan odds of 53-1! This resulted in the suggested narrow Exacta wager cashing for over $900. The Super Screener’s Top Win pick, #9 Mirth, came through again on this day and produced solid value at 6-1. 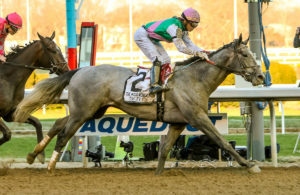 This horse was on a progressive form cycle ascent, which form cycle analysis indicated would be another strong move forward, which is what transpired. With that victory, it triggered 3 of the Super Screener suggested Pick 4 wagers to cash totaling $1,346. Huge weekend ahead with Kentucky Derby implications as a salty field of 3-year-olds line up in the Fountain of Youth (G2) which has always been a key penultimate Derby prep. In addition to the FOY, there will be 8 other graded stakes to choose from — a big day of racing ahead. 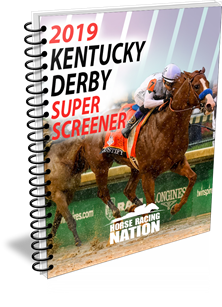 Get Your Super Screener for the Derby Trail HERE! Until this coming weekend, Go Fast and Win! Next Story → Rebel, Rebel Recap! 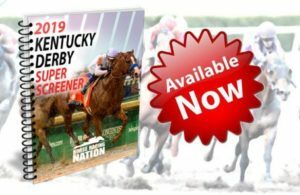 Kentucky Derby 2019 Super Screener Now Available!